For many years in my life, looking in the mirror was painful. I hated what I saw. There were many days I felt ashamed to leave my house looking the way I did. I used to have massive cystic acne. Last month in this column, I wrote about the healing of my acne and how I realized my physical health was intrinsically connected to the health of our planet. I talked about the 3-day juicing detox that opened my eyes, how I systematically “detoxified” my home after that, and the extraordinary improvements I saw in my health as a result. But what I didn’t share with you was the most important pivotal moment in my healing journey. And it has nothing to do with food or chemical toxins. This is the most important word any of us can come to apply, and I want to share with you why it was critical for my healing. It’s something nobody talks about. Not your doctor. Not your nutritionist. Not your fitness guru. In fact, in a world where we’re programmed to look outside ourselves for both the cause and the solution to everything, the “F-word” often feels foreign and irrelevant. Why forgiveness for healing, you ask? I can imagine you telling me forgiveness is totally unrelated to your health and almost every problem you have in life. What could forgiveness possibly have to do with healing? Because I’m a counselor, I sat down to journal about this thought. I began to realize that the feelings of self-hatred and shame I felt when I looked in the mirror were likely not because of the acne; maybe it was the other way around. Maybe, just maybe, the terrible feelings were not only keeping the acne in place, but might also be the cause of it. From that day, I started looking at myself very close-up against the mirror in order to focus on a tiny patch of skin on my cheekbone that was always clear. I would caress it and say, “I love my beautiful rose-petal skin.” And as I did, I focused on feelings of love for that tiny patch. I did that as a way to genuinely feel love for that little patch of rosy skin, because I could not look at my whole face and say “I love my skin” without feeling like a fraud. As I practiced this little affirmation, my attitude towards my skin began to shift. I started to take on a more loving approach to it rather than doing battle with it. But the biggest shift was yet to come. In October 2007, I spent nearly a month in Arizona attending several events. One of them was a week-long retreat with one of my dearest teachers and shamans, Anahata, Dancing Butterfly. At that retreat, she walked us through a writing exercise that made me focus on a traumatic event I had experienced in college. You see, I was date-raped when I was 20 years old. It had not escaped me over the years that my acne began after the event. I had never had acne in my teens. And even though I had this awareness, I didn’t know what to do with it. I had already been to counseling. I’d written an angry letter and burnt it. I’d been able to name the event and be clear about what happened but I had not healed, not emotionally nor physically; I didn’t know what else I needed to do. That writing exercise at the retreat in Sedona turned my point of view around. I shifted from being the victim of the events (and of my skin) to reclaiming my power to create healing for myself. It was the first, essential step in being able to forgive myself for getting into the situation in which I was assaulted. And it was the first step in being able to feel pity for the guy who did it. Over the next few weeks and months, I was able to complete a process of forgiveness where I could see the entire event and situation from a different perspective. I was able to reclaim my ability to feel peace, joy, and compassion. I felt whole again. I was able to see through his woundedness. I realized that only someone who has been hurt and become deeply insecure would do what he did. He was “the popular guy” who everybody loved in college. He was charismatic and charming. He was a delight to be around. But clearly, he didn’t have the self-love, confidence, or self-respect to be an honorable, gallant man. He did the sleazy thing when I was inebriated. When I was finally able to choose forgiveness and true compassion, I felt as though I’d been exorcised. The acne never came back. That was the critical moment. 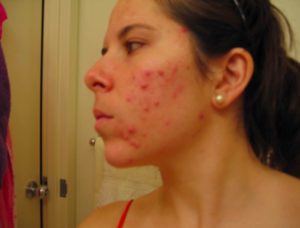 My acne had improved with all of my healthy food choices and detoxification of my home. But when I took that picture in April 2007, I’d already been doing juicing, liver-flushes, and eliminating chemicals from my home. Come December that year, just two months after the Arizona retreat, I had perfectly clear skin. Forgiveness was the key ingredient. 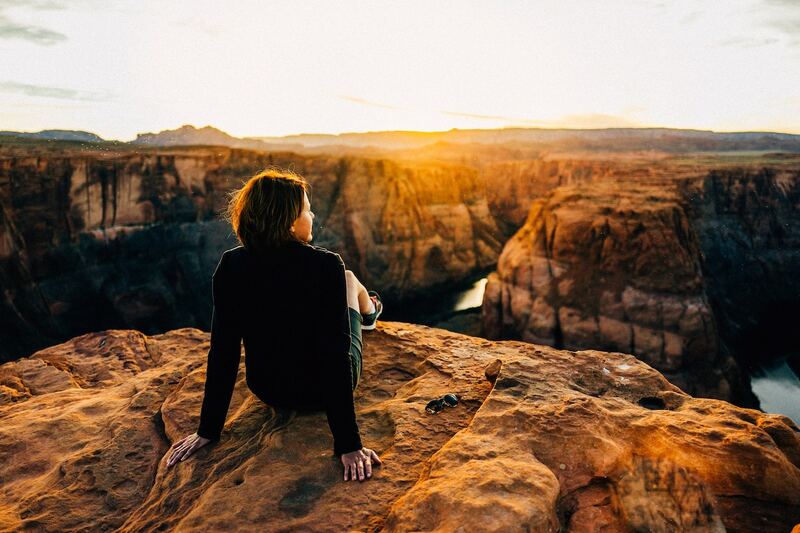 Morella Devost facilitates profound transformation for people who want to thrive in every aspect of life. 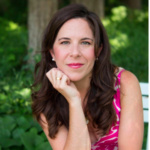 After receiving two masters degrees in counseling from Columbia University, she also became a Clinical Hypnotherapist, NLP facilitator, and Holistic Health Coach. Morella is a Venezuelan-Vermonter who works with people all over the world from her beautiful office in Burlington, Vermont.